Translations according to different languages. 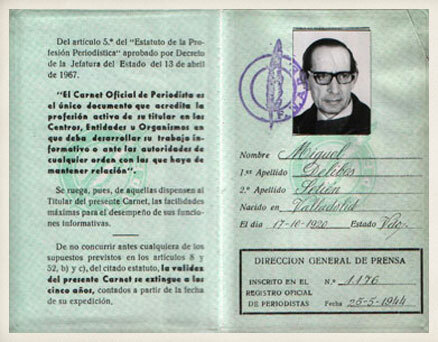 Right in the post-war period, Miguel Delibes starts his Law studies. It enters, by opposition, in the Castilian Bank, remaining in it only six months. 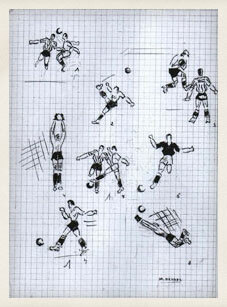 In September he published his first newspaper article: “The sport of big game”. On the 9th of February he is named editor of the newsapaper El Norte de Castilla. He starts reviewing films and he illustrates them with caricatures of the main characters and he signs them up under the pen-name MAX: M stands for Miguel, A stands for Ángeles and X stands for the future. On the 27th of February he publishes his first cinema critique. He passes the public examinations for the seat as Frofessor at the Business Studies School, in this way he starts to balance his job as a journalist and his teaching job. One of the texts he had to learn by heart to pass the mentioned exam, will be his incentive for his literary vocation. 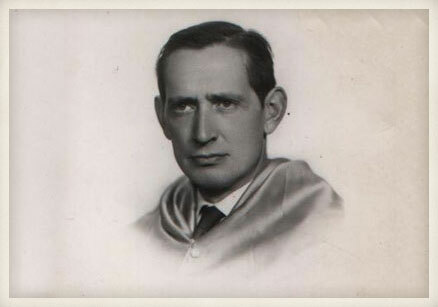 Miguel Delibes, orla de la Escuela de Comercio de Valladolid, años 50. On the 23rd of April he gets married with Ángeles de Castro at the Lourdes School in Valladolid (his former High School). The Groom gave a bicycle as present to his Bride, and she gave him a typewriter. The honeymoon destination was Molledo Portolín, a small village in Santander where the writer has his family roots. On the 12th of February his first male child, Miguel, was born. He became a PhD in Biological Science and Professor at the Higher Council of Scientific Investigation. He also was director of the Biological National Park of Coto de Doñana from 1988 to 1996. 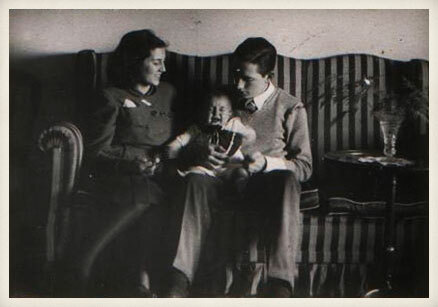 Miguel Delibes con su esposa y su primer hijo, Miguel. 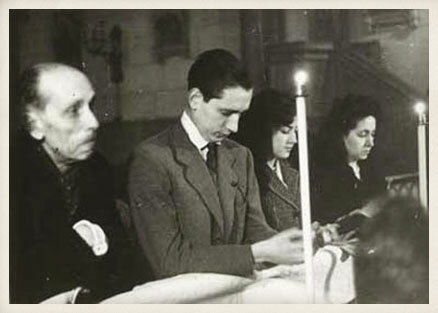 Enero de 1948. Delibes finishehisfirst novel, “La sombra del ciprés es alargada”. Prior to this he had only written his Thesis of degree “Causas de la disolución de las compañías anónimas” and a tale named “La bujía”. With this tale he wins a second position in a brief narrative contest organized by the magazine Medina, on its femenine section. On the 6th of January his novel “La sombra del ciprés es alargada” achieves the Nadal award in its fourth edition-1947-, the finalists were Manuel Pombo Angulo and Ana María Matute. The novel is published in April, short after the birth- on the 23rd of March-of his first daughter, Ángeles. Same as his elder brother, she is a biologist and nowadays she is a Biochemestry Professor at the Technical School of Agronomist at the Universidad Politécnica of Madrid. Official communication of the obtaining of the Nadal Prize directed to Miguel Delibes. January 7, 1948. From this year are the first letters between Miguel Delibes and his future to be editor, JosepVergés- Founder of Destino Publishing House and whom he will meet a few years after and will have a close friendship until the death of Vergés in 2001. In October of this year Delibes publishes his second novel “Aún es de día” which suffered numerous censoring cutbacks. When he achieves the seat as Professor of History at the Business School, he writes and publishes for a printing house of Valladolid a Summary of the Spanish History as the text book for his lessons. This manual will be later on withdrawn by the authorities arguing differences between the narration and the most recent Spanish history. On the 25th of May his third child, Germán, is born. He is and Archeologist and Professor of Pre-history at the University of Valladolid.